For the novice, and the connoisseur. Port Askaig is a small town on the northeast coast of Islay where it faces the island of Jura less than 1/2 mile away on the other side of the Sound of Islay. The Port Askaig Whiskies are a brand of Islay single malt Whiskies named after this picturesque town. London-based Specialty Drinks created the brand by collecting selected casks from some of the largest and most reputable single malt distilleries on the island and producing a series of independent single malt bottlings. 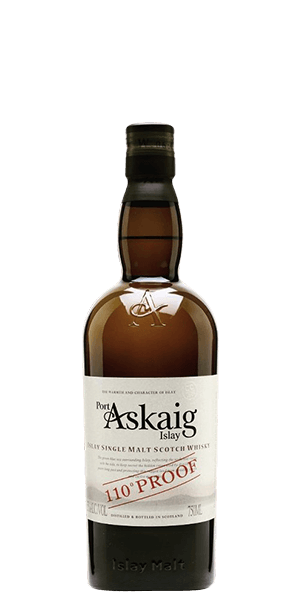 Port Askaig 110° Proof is aged in American oak barrels and bottled at 55% ABV. Like each of the expressions in Port Askaig’s range, they are released in limited batches which yield an unparalleled consistency and quality of character, that ensures each Whisky maintains its original flavor and dignity. Nonchill-filtered and naturally colored this exclusive release is the first of this unique range of single malt Whiskies from Port Askaig to launch in the US. What does Port Askaig 110° Proof taste like? The Flavour Spiral™ shows the most common flavours that you'll taste in Port Askaig 110° Proof and gives you a chance to have a taste of it before actually tasting it. A Good drink for a peat fan. A little peaty, clove and licorice. Not too bad. Honestly, that apple, sweet, crisp candy scent came through strong on the nose. I thought one thing, then was hit with a strong smoky flavor. That melted away into a little alcohol bite and complex chocolate, peaty raisin finish. It's really very good and complex. One of my favorites that isn't an old standard like Lagavulin 16. Found it through a tasting box. Really different than anything i’ve had before. First thought, its smells and tastes like band-aids. Smokey on the nose but much less so on the tongue. Not as hot as some are saying, but I like spice so proceed with caution if you don't. I really like the flavor. I wish Flaviar had more of thier samples for sale. This is number 15 out of my Advent box, and most are not available. People have it right: it’s smoky. But I found it enjoyable without burning or heat. very light in color, very smoky which is not for me at all. very smoky! Nose and taste. Better with a cube of ice. Much darker flavors than it looks. Very smoky. Deliciously peaty and smoky but still sweet at the same time. The nose was strong and the taste of smoke, coal, and peat was overpowering for all who tasted. No one would purchase a full bottle of this whiskey. Plenty of heat and a wonderful flavor. Too much heat for me. The peat was fine. Overall not an enjoyable drink for me. I had a portion from the Christmas advent calendar. Almost poured it out. But I did not. Don't want to waste it. Deceptively clear. This is an exceptionally complex Islay, with peat and the ocean and bandaids in the nose, a lot more sweetness than you’d expect in the taste, along with almost everything in the nose, a hint of citrus and chocolate, and a ridiculously long finish that’s chewy in all the best ways. This is my favorite advent calendar offering to this point. Hotter and peatier than I prefer.